Mt. 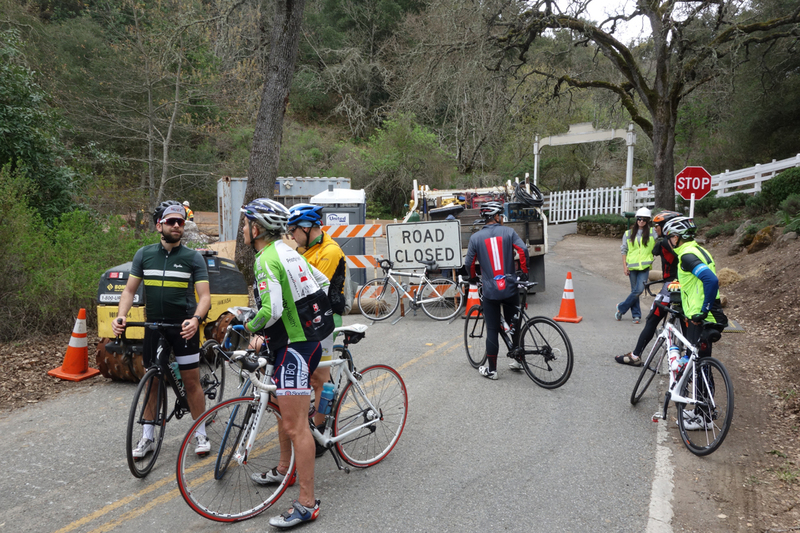 Hamilton Road is closed for repairs about 1.5 miles up from the Grandview Restaurant. UPDATE (March 30, 2017): The road will be closed another 4 weeks. Don’t try to get by because there’s a cliff at the construction site. Caltran is building a steel-reinforced support wall and will fill it in with dirt before paving. A couple of mountain bikers didn’t take “no” for an answer and headed off-road down the steep embankment. It’s unknown what happened to them, but they didn’t come back up. At the bottom of the ravine there’s a creek and conceivably they could have taken Alum Rock Falls Road back to Alum Rock Park, or hiked uphill over to Grant Ranch Park’s dirt roads. California state highway 130, otherwise known as Mt. Hamilton Road, is closed for repair about 1.5 miles up from the Grandview Restaurant. Estimated completion is six weeks from today. Quimby Road is the only alternate route and believe me, you don’t want to take it. A culvert got plugged or gave way and so went half of the road on the steep embankment’s eastern slope. I can’t tell you if road crews work on Sundays or give any insight as to whether or not you can get through as the days go by. Right now though it’s impossible. There’s someone there at all times during construction assigned to keeping people out. Mt. Hamilton Road is open up to the slide construction area, so you can still enjoy rides on Crothers and Clayton roads. This entry was posted on March 18, 2017 at 2:45 pm and is filed under News. You can follow any responses to this entry through the RSS 2.0 feed. You can leave a response, or trackback from your own site. On the bright side, it will be a ride you won’t forget. On Thursday, my buddy rode Quimby and then 130 to Lick. Then back down 130 all the way to Alum Rock Ave. The latter was done after 6pm. Rode Quimby on Tuesday over to the park. It was hot that day, not a terribly great one for a climb like that.